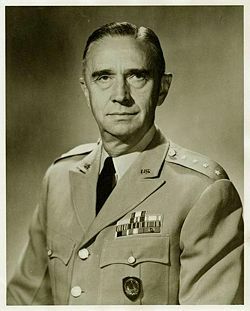 Cortland Van Rensselaer Schuyler (December 22, 1900 – December 4, 1993) was a United States Army four star general who served as Chief of Staff, Supreme Headquarters Allied Powers Europe (COFS SHAPE) from 1953 to 1959. Schuyler was born in Mount Arlington, New Jersey on December 22, 1900. He attended Columbia High School in Maplewood, New Jersey. He graduated from the United States Military Academy in 1922 and was commissioned in the Coast Artillery Corps. His first assignment was at Fort Monroe, Virginia, where he was assigned to the 61st Antiaircraft Battalion, at the time the only anti-aircraft unit in the army. Later he served with the 60th Coast Artillery (antiaircraft) in the Philippines and the 4th Coast Artillery (Antiaircraft) at Fort Amador in the Panama Canal Zone. In 1939, while a member of the Antiaircraft section of the Coast Artillery Board, he participated actively in the development of the first multiple, power-operated antiaircraft machine gun mount. He was awarded the Legion of Merit for his work in this field. Prior to becoming Chief of Staff of SHAPE, Schuyler commanded the 28th Infantry Division from November 1952 to July 1953 as a Major General. After retiring from the army in 1959, Schuyler served as Commissioner of the New York State Office of General Services from 1960 to 1971. Schuyler died on December 4, 1993 in San Antonio, Texas. He was survived by his wife, two children, and two step-children.